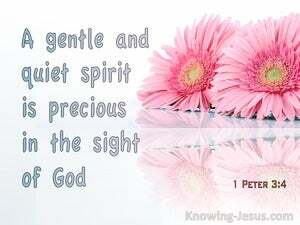 ﻿ 1 Peter 3:4 but let it be the hidden person of the heart, with the imperishable quality of a gentle and quiet spirit, which is precious in the sight of God. For the LORD takes pleasure in His people; He will beautify the afflicted ones with salvation. to malign no one, to be peaceable, gentle, showing every consideration for all men. The King's daughter is all glorious within; Her clothing is interwoven with gold. Behold, You desire truth in the innermost being, And in the hidden part You will make me know wisdom. He does not delight in the strength of the horse; He does not take pleasure in the legs of a man. "SAY TO THE DAUGHTER OF ZION, 'BEHOLD YOUR KING IS COMING TO YOU, GENTLE, AND MOUNTED ON A DONKEY, EVEN ON A COLT, THE FOAL OF A BEAST OF BURDEN.'" "You foolish ones, did not He who made the outside make the inside also? Now such persons we command and exhort in the Lord Jesus Christ to work in quiet fashion and eat their own bread. 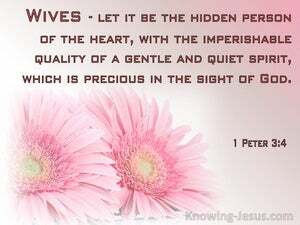 for kings and all who are in authority, so that we may lead a tranquil and quiet life in all godliness and dignity.